How can it justify its new dogfighting app? How will Google apply its famous corporate motto “Don’t be evil” to the fact that its subsidiary, Android, is marketing a depraved and degrading “game” called Dog Wars? The Dog Wars app, available only on Android phones, boasts that it “will never be in the iPhone store.” Gamers get to choose a virtual dog, train him and then put him in the dog-fighting ring against another dog. Depending on his fitness and training, he may kill the other dog and win you some virtual money and street cred. Then again, he may be badly injured or killed. Those who have downloaded and tried Dog Wars report that it’s nothing more than a virtual lesson in how to raise dogs for fighting: from choosing the kind of food that will toughen them up, to giving them the kind of training and discipline they need to be fighters, and then to how to prepare them for the ring. The people at Kage Games, the makers of this app, seem surprised that anyone would be outraged by their latest offering. Company shills are running for cover with the tired old excuse that “it’s just a game” and is protected by the First Amendment. But where does that defense lead? To games that involve molesting children and selling women into prostitution rings? Regardless of whether Kage Games has a constitutional right to produce “games” like these, and whether Android/Google has the right to host them, we all have the right to tell Android and Google that we want no part of their company. Those of us considering a new phone have options. And when it comes to search engines, Bing is a very good alternative these days. Already, thousands of people are making their views known to Google/Android. It’s time to remind a company that’s gone out of its way to include caring for dogs in its Code of Conduct that it’s fallen way off the map and needs to take fast action to reclaim the moral authority for which it once strove. What do you say? Let us know your own views here or on Facebook. Our colleague Stephanie Feldstein has created a petition on Change.org. Please go ahead and sign it. You can also e-mail Google to express your views and let them know you are switching search engines until and unless they remove this app from Android. 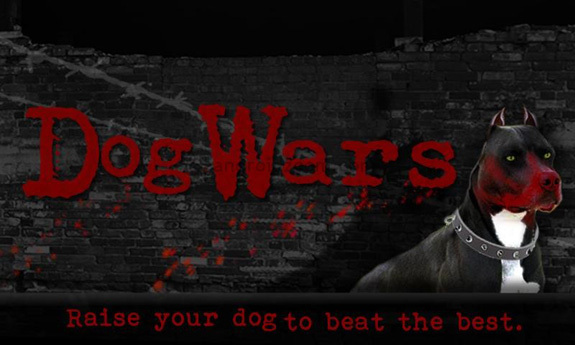 The Dog Wars app was taken down due to trademark infringement, but has been re-released after the name was changed to KG Dogfighting and is currently available under that name.